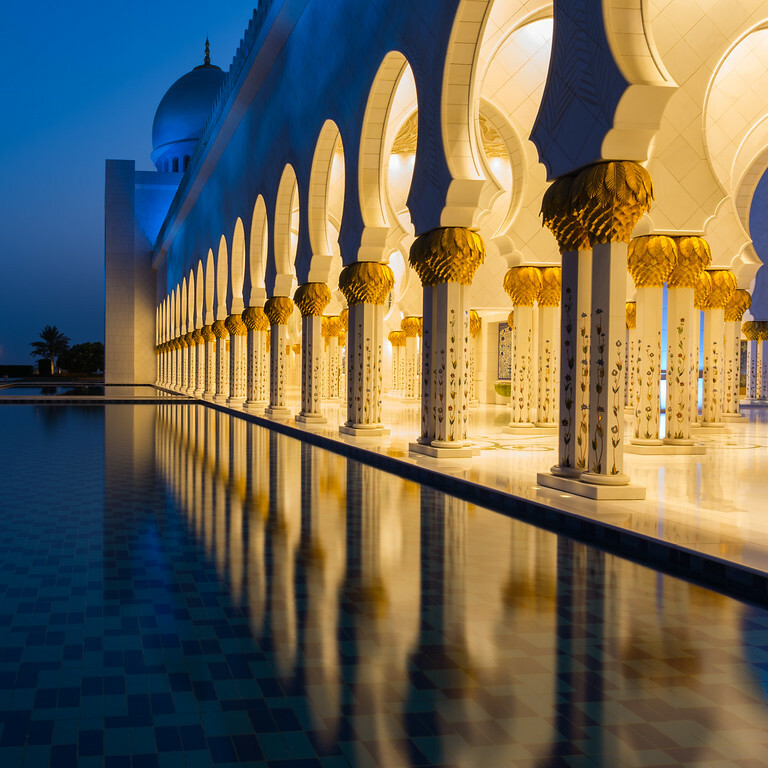 The Sheikh Zayed Grand Mosque , located in the emirate of Abu Dhabi is one of the largest mosques in the world. It’s an impressive complex which can be been from some distance away. In fact it looks almost as good from a distance as it does close up. Construction work on the mosque started in 1996. It was completed almost 12 years later and was opened opened to the public and prayers on the 20th of December 2007. The first prayer was held in the presence of His Highness Sheikh Khalifa bin Zayed Al Nahyan, who the mosque is named after. 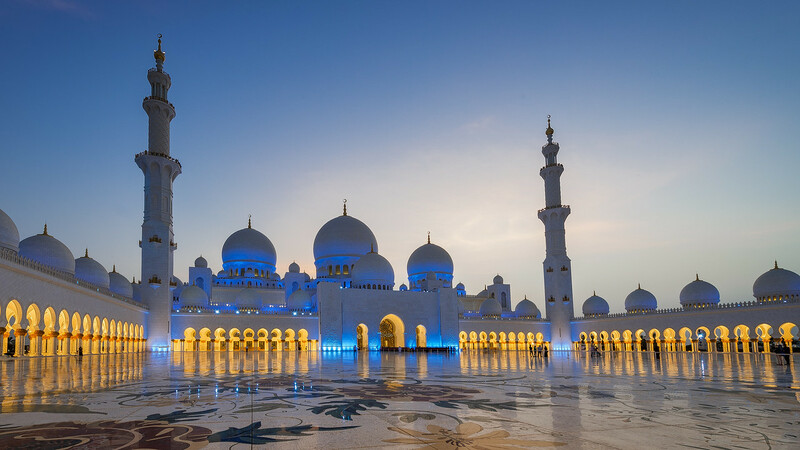 It’s said to be the third largest mosque in the world, after one in Mecca and Medina and features 82 domes, with the main dome being the largest in the world. the mosque can accommodate 41,000 worshippers, with over 7,000 in the main prayer hall alone. the carpet in the main prayer hall was hand knotted in Iran and took 35 tons of wool and 12 tons of cotton to complete. 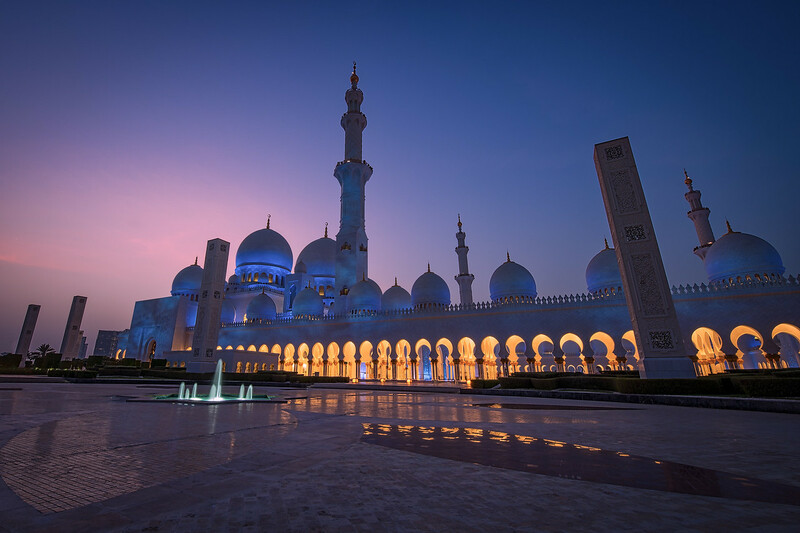 The first time I visited, I wanted to photograph around the Mosque at sunset, so hired a car and drove from Dubai to Abu Dhabi. The mosque was found fairly easily but as I went to drive through the entrance and into the car park, I was singled out from all of the other traffic, stopped by security and turned away. In hindsight, it wasn’t too surprising – It was at sunset on a Friday during Ramadan and I was wearing shorts. If you know anything about Muslim culture, you’ll know there wasn’t much more I could have done wrong and having visited the region numerous times I should have known better. You live and learn! So, second time round, I checked the website to confirm that it was possible to visit during the time I wanted and made sure I was suitably dressed. It was well worth making the effort and going back. The interior of the mosque is lavishly decorated and is stunning to see. It’s possible to walk around the complex with minimal restrictions. Shoes do need to be removed to go inside. The symmetry of the building is beautiful and as the daylight faded, the the building came alive with blues and golden tones, reflected in the pools along either side of the main courtyard. I walked around photographing the angles and views I wanted, until the light faded and it was completely dark. If you want to visit the Grand Mosque, make sure to check the visiting times on their website. There is one small café on the site. It’s reasonably priced and the food’s not bad. In the summer it offers some welcome air conditioned respite from serious the heat. If you want to photograph, tripods are allowed but if like me and you like to minimize people in your pictures, you may need to be patient and take multiple pictures from the one place to edit people out afterwards.